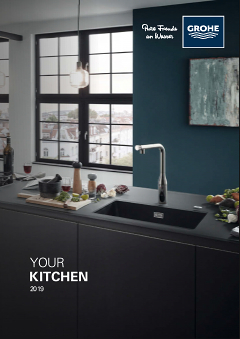 This Europlus kitchen tap has a standard outlet with a practical swivel range of 140°. The tap has a modern and smart ergonomic design. The metal handle has an angle of 7 ° which, coupled with the GROHE SilkMove technology ensures very smooth handling . The tap has been made with GROHE StarLight chrome. The tap is delivered with flexible connection hoses, making the installation a lot easier. Modern appearance and intelligent ergonomics.